Foot shearing machine (website:xinnuochina.com/cutting/26.html)is made up of cast iron, adopt the foot type, the pull rod and spring. This machine commonly used in hardware, electrical appliances, color tile and sheet plate cutting material. It is Suitable for sheet metal cold shearing. Before using, should keep the machine balance, usually add oil, keep the oil cup has oil, so that lubrication, work light. It need not the electricity, it shearing by hand. It has Reasonable structure, shear automatic reset and foot light freely, is equipped with shear keep-off and stepped poles folding device, Shearing quality: neat, straight line, with no burrs, achieve precise shear effect. Saving electricity and strength, precision shearing, convenient operation and practical. After shearing, it should be able to guarantee the cut sheet metal shear straightness and parallel requirements, and try to reduce plate distortion, in order to obtain high quality of the workpiece. 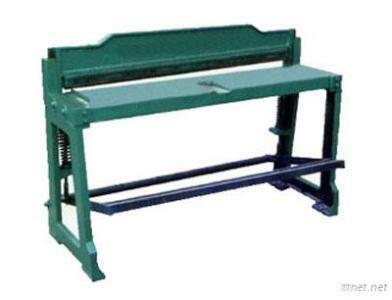 Foot shears appearance, novel structure, sliding rails, riding a tension spring sliding fulcrum fixed its operations reduced by two-thirds of part of the machine is equipped with pressure feeding device, high cut quality and light weight easy to move, widely used in the sheet metal industry manpower cut material. Foot shears are made ? ?of cast iron cast, foot, rod and spring links on the turret, the turret, the left and right wall, and left and right slide and pedal parts.